Corrugator | Tensor Machinery Ltd.
Our Corrugator is designed for corrugating metallic tapes, up to 150 mm wide (6), allowing the cable to be flexible after the tape is formed around the cable. Other widths are also available upon request. The corrugator can be supplied with a variety of corrugations pitches depending on the cable diameter. Rollers with 10 to 18 corrugations per inch are available. 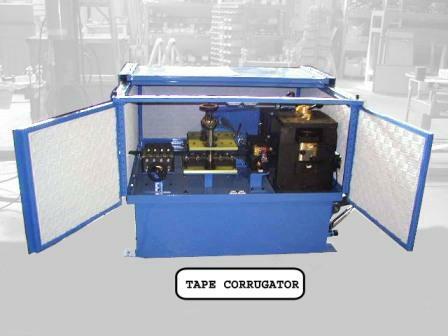 A tape guide and tape tensioner can be mounted at the entrance of the corrugator to ensure the tape is aligned and feeds straight into the corrugating rollers. The corrugation depth is adjustable by a centrally mounted, single screw. Air pressure is applied to both sides of the roller to ensure even corrugation along the length of the corrugating roller—which means no more worrying about separate side-to-side adjustments. A jog button and manual jog speed setting allows the operator to feed the tape through the rollers, improving the ease of threading. Special covers provide added safety, ensuring only the tape feeds into the rollers. The corrugator design makes it simple to change out rollers in less than 30 minutes. A dual loop dancer attached to the exit of the corrugator controls the speed. The dancer also applies tension on the corrugated tape using a pneumatic cylinder. In order to pass flex-test of the armored cable, it is important that the corrugations be symmetrical and the tape is not stretched. 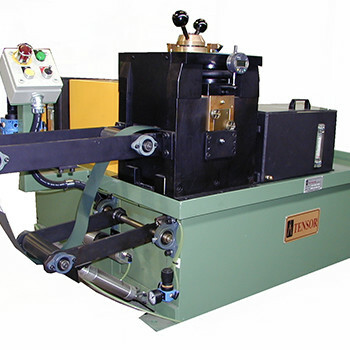 The Tensor corrugator drives both the lower and upper corrugating rollers—ensuring symmetry of the corrugation at all depths and preventing stretching of the tape. This is especially critical for aluminum tapes. 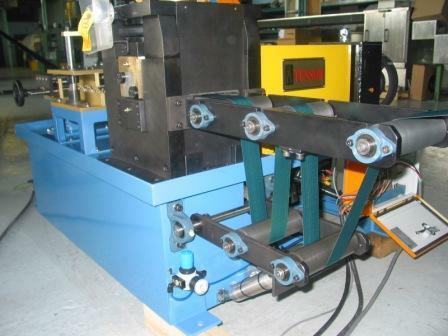 The design allows the top roller to move vertically to pass the weld, yet is positively driven at all times. A noise abating cover completely encloses the corrugator, reducing noise to below 83 dB. The cover slides open and doors swing open to allow the operator to feed the tape into the machine. 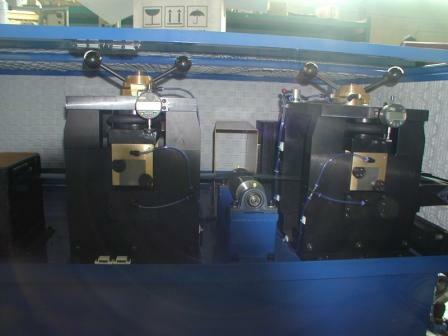 A tape oiler system can also be mounted before the corrugator to supply a thin film of oil on the tape. The oil is used to assist in forming the tape around the cable core. When Tensor’s rollformers are used, oil is not required.